After an thorough selection, look what a nice collection was smiling at us. Good, isn’t it? We just must share this picture with you. We are endlessly honoured that both Flame Painter and Amberlight continuously receive lots of visibility in world press. 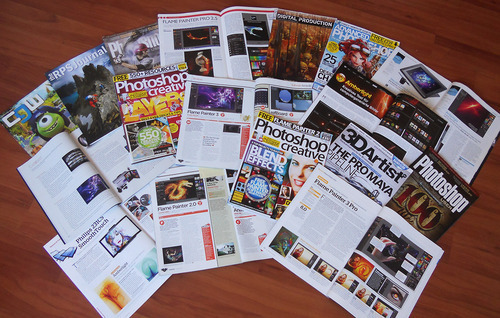 There are features in the most iconic and every-CGfan-must-have print magazines like ImagineFX, Photoshop Creative, 3D Artist, Photoshop User, 3D World, CGW and many more. Moreover, more than 200 articles and mentions were written about our software on the graphic design, IT and art-oriented websites from all around the world last year. This is a dream for every indie developer team like us….and we are living it! It’s a great feeling to know that you guys care about what we are doing. We appreciate your continuous commitment very much.